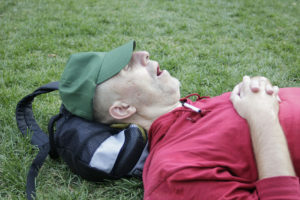 Sleep Apnea in San Francisco: Don't Take It Lying Down! How do you know if you have sleep apnea? The answer is that you probably do not. However, loud and constant snoring may be an indicator: if your partner complains about your snoring this could be a wake-up call. Other symptoms can be feeling tired during the day, being unable to focus on your work, loss of memory, and personality changes. Risk factors include excessive use of alcohol or sedatives, nasal congestion, being overweight, a family history of snoring, and being male – since men are more likely to snore and suffer from it than women, although it is the case that women snore more after the menopause. Sleep apnea is a disorder in which you have pauses in your breathing while you are sleeping. Breathing pauses can last from a few seconds to minutes and can occur up to 30 times an hour, or even more. Typically, normal breathing then starts again. The condition can disrupt your sleep because when it occurs you can move from deep sleep to light sleep. Poor quality of sleep can lead to the feeling of tiredness during the day, which in turn can result in work-related accidents and driving accidents. If not treated, sleep apnea can increase your risk of hypertension (high blood pressure) which in turn increases your risk of stroke, heart attack, and diabetes. It can also increase the risk of irregular heart-beats and increase the risk of heart failure. The condition can be treated with sleep apnea surgery San Francisco. Surgery is carried out to widen the breathing passages and usually involves resetting the lower jaw, or shrinking, stiffening, or removing excess tissue in the mouth or throat. Our doctor, Dr Alex Rabinovich, has carried out sleep apnea surgery San Francisco on many occasions. He offers a free consult to all patients, so if you think that you may be suffering from sleep apnea it is well worthwhile reaching out to him for the benefit of his advice. In order to arrange an appointment to see Dr Rabinovich call the office on (415) 817-9991 or email info@doctorrabinovich.com.